The Pelicans Landing Dock is a sturdy boat dock where ships land, unload, and load. With so much to do, the adventurous imagination of children can not help but be sparked. This deluxe, detailed dock comes with a variety of accessories to make pretend marine life all the more realistic. 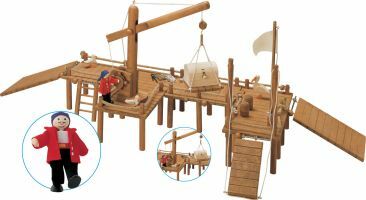 Let your child participate in unloading exciting cargo, discovering castaways, and meeting pirates with this incredible dock. Includes crane, flag, and more!